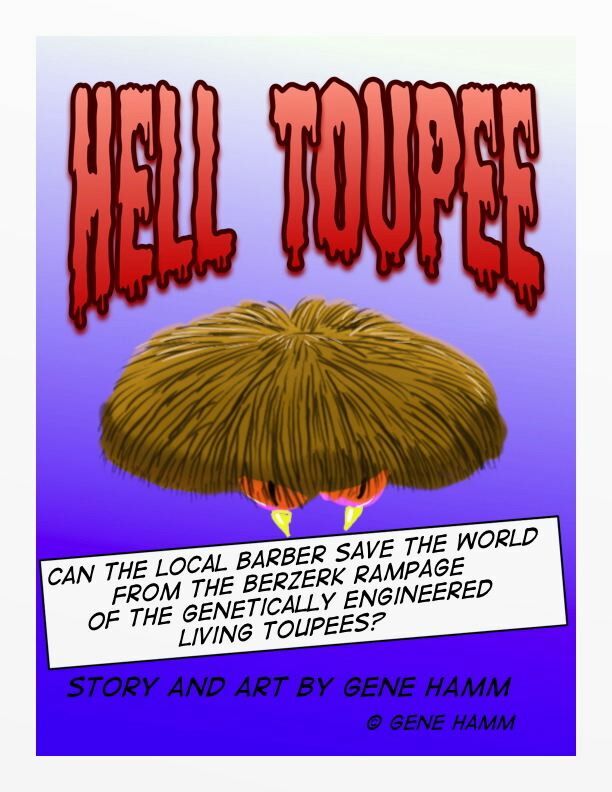 scroll down for free preview of "hell Toupee"
In "Hell Toupee", when the first ever experimental genetically engineered living toupee escapes the lab on a murderous rampage, can the local barber save the world? You can buy it from Amazon in paperback or on Kindle. OR YOU CAN BUY A PERSONALIZED AUTOGRAPHED PDF FOR $4.99. Just click on the link below. As soon as I get an email from PayPal, I will send you an autographed PDF via WeTransfer.com. At 868 drawings, it is a real bargain. Scroll down to the bottom of the page to see a free preview the first chapter of "Hell Toupee". If you don't have a PayPal account, just email genehamm@sbcglobal.net and say you want a request money form and I will send it to you. I am trying to make it as easy as possible to part you from your money. If you like HELL TOUPEE, please recommend it to your friends. If you hate it, please recommend it to your enemies.